Still a work in progress- Canadian soldier on summer exercise, West Germany, Late 1950s. 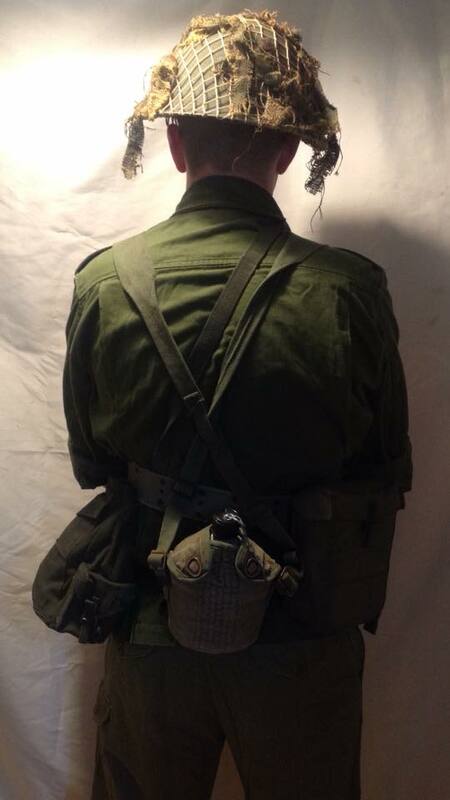 I'm wearing the 1949 pattern bush jacket with 51 pattern webbing and respirator haversack and armed with an Inglis production Browning Hi-Power with tangent rear sight. I don't currently have the correct pattern trousers so these are British 52 pattern jungle trousers which at least match the colour. I also don't have the correct cap yet, hence the MK III helmet. I have been told to drop the respirator haversack down an inch or two to make it a more comfortable fit with the rest of the web gear. 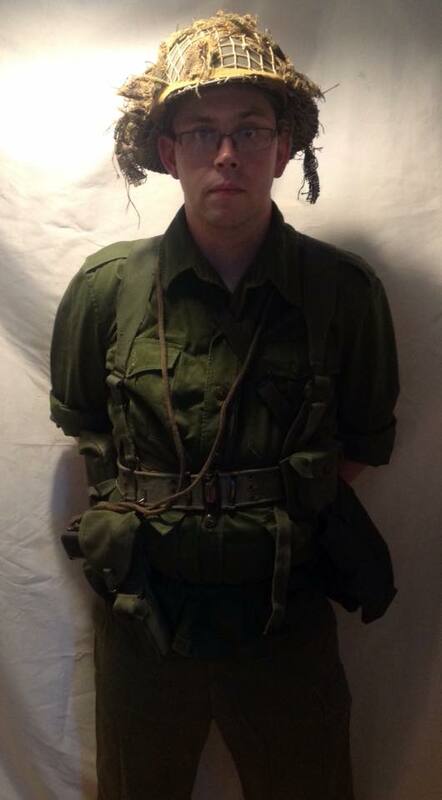 This is the first time I have had enough Canadian kit to even attempt putting together an impression, I think I would be right in saying I am the only person in the UK doing this period for Canada at the moment and I am looking forward to the puzzled looks I am going to get on Sunday at my local military history weekend! Good start. You need the OD 7 armlets for wear on the sleeves of the jacket. You might also want to shift the water bottle and carrier to the left of the left-hand shoulder strap buckle, so that it sits more on the left hip. This would leave the back centre of the web belt free to carry things like the rolled poncho. Hi Ian, I had it there initially, but the respirator haversack was pushing it up and outwards so it was really awkward, which is why I moved it to the small of the back as it fitted round easier. I will see if dropping the respirator a few inches makes a difference and lets it sit a bit flatter though. Yes, rechecking your photos, I would definitely say you should drop the respirator carrier by lengthening the shoulder strap. It should ride just below the hip bone, not quite as high as you have it. Otherwise, your interpretation is coming nicely. Good luck in finding the other items you need. Dropping the respirator worked and lets the canteen sit much more easily over the hip. You may want to consider a Browning without the tangent rear sight as the ones we (Canada) used had the fixed rear sight. 37patt wrote: Nice looking set-up. Not always. The odd No.1 Mk.1* with the slot and tangent rear sight slipped through. I was issued one from time to time here in Canada late 1970's early 1980's. Over the last 35 years I have seen several Brownings with the stock cut on the frame and several with the Chinese inscription as well, however I was under the impression that we purged our inventory of the Chinese models in the post war period as they were non standard. BAP, did you get issued ones with just the stock cut or ones with the tangent sight as well? What time frame were they issued to you, as the final push to convert them all to fixed sights came about in 1971. 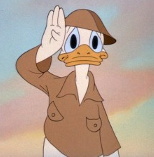 I'm just thinking that you must be old, LOL, to have received an unmodified one while in service. Warspite, I can fully understand "it's the only one I have". 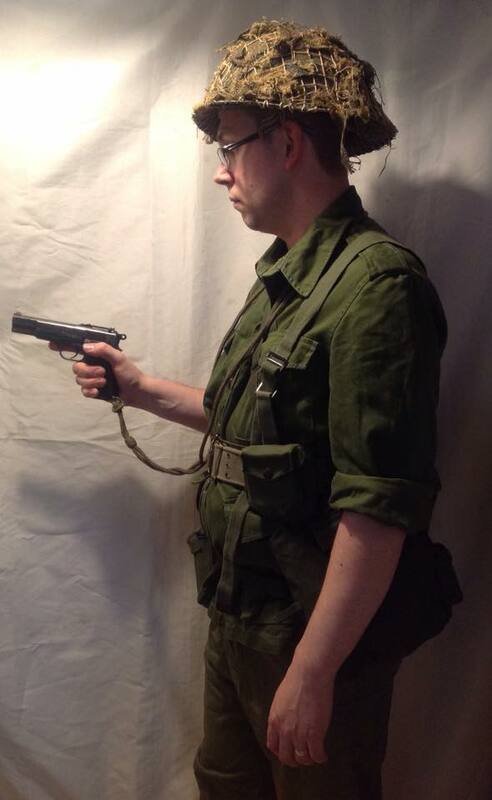 My poor Canadian soldier from the early 1980's has a Belgium FN as it too is the only one I have. We do the best we can with what we have. It's still a very nice impression, well done. 37patt wrote: Over the last 35 years I have seen several Brownings with the stock cut on the frame and several with the Chinese inscription as well, however I was under the impression that we purged our inventory of the Chinese models in the post war period as they were non standard. Thanks BAP, some interesting info. What year/time frame would that have been? Units here in Ottawa are still receiving pistols with the M.A.P. stickers on the front of the frame. We certainly get our moneys worth out of our kit. 37patt wrote: Thanks BAP, some interesting info. What year/time frame would that have been? I was in 1977 to 1984. My HP and SMG days dated to the mid to late range of that (before I was only trusted with FNC1A1 or C2's). That, kind sir, is why you need on of each! !